Ridley abandons his stable of losers (The Drift, 2002, etc.) and creates a female cop in a near-future dystopian Los Angeles filled with psychic mutants. You see, this is a Marvel comics graphic novel without the illustrations: a comic-strip sucking up the old flame-dripping images of Stan Lee and the gritty pages of Frank Miller’s The Dark Knight whose Batman comes out of retirement at 52 to fight endless horrid mutants crawling through Gotham. Well, every night that Soledad O’Roark goes out with LAPD’s Mtac (Metanormal Tactical Unit), which keeps superhumans in check, there’s a one-in-four chance she won’t come back. Her first night out, her fellow officer Reese gets her chest holed open by flame lobbed by a fire mutant and loses a lung. Soledad’s .9 mm cartridges turn to slag before hitting the pyrokinetic and while her personally modified Metalstorm all-electronic handgun’s white-hot phosphorous bullets do rip up the pyro freak, Soledad herself takes some heavy burns. The horror in heat-fused San Francisco first produced the freaks, who include telepaths, telekinetics, invulnerables, intangibles, impenetrables, levitators, and metal morphs. Soledad’s gun, which fires rounds varied for each type of freak, earns her the nickname Bullet. But her modified Metalstorm can’t yet take out intangibles and telepaths. All this also offers Ridley a candy shop of comic-book villains and superheroes, such as the Human Torch, to rip off and revise as superfreaks with incredible powers. A geomagnetic mutie can move earth and rock, do low-grade terraforming. Freaks like Quadrupleman walk around veiled as normals, since the Prez has issued an Executive Order: leave or die. Some hit Europe, where they wear their costumes, do superhero shtick. First, Nightshift showed up, did wonders catching perps, but then supervillains bloomed to oppose him. 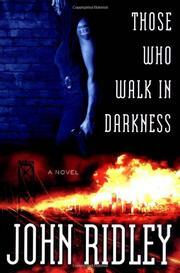 Thrill Kill, Death Nell—and Bludlust, whose crazy megaweapon leveled San Francisco. Soledad’s big villain: the telepath, with whom there’s no defense—not when he’s her lover. Clearly a series, with this opener hard to match.